While SingTel is rapidly expanding its hold over the Southeast Asian region, dissent for the telco on home shores is surfacing on its social media channels. A quick look at SingTel’s Facebook page showed a reasonably high number of comments on each of its posts, with many of these often being negative. For example, one lighthearted post on its 4G network speed being put to the test against parkour received 88 likes and 32 comments, with close to all comments being negative. The post went unanswered. Another more recent post on it receiving an award received 96 likes and 45 comments – most of the latter also was negative. Another post on SingTel giving away VIP tickets UEFA Champions League finals in London also received 28 likes and five comments, all of which were negative. While there are comments on the page which are positive and several negative comments were answered by a spokesperson, the page appears to be a rampant ranting ground for unhappy consumers. Its Twitter page also receives its fair amount of negative comments. SingTel has invested substantially in its social media strategy, with a dedicated in-house team. It was also one of the first few brands to go on Twitter’s Promoted Products suite, too. However, Gavin Tan, social media manager at Yolk said its status as the first Singaporean brand to use Twitter’s Promoted Products suite would be irrelevant if it did not turn around its negative image on social grounds as Promoted Tweets can still be replied to and mentioned. What then is SingTel’s take on its social media strategy when it comes to crisis management? Johan Buse, SingTel’s vice president of consumer marketing, told Marketing that it does not outsource the management of its social media channels to a third party and that its in-house team of social media managers assist customers with queries and service issues. 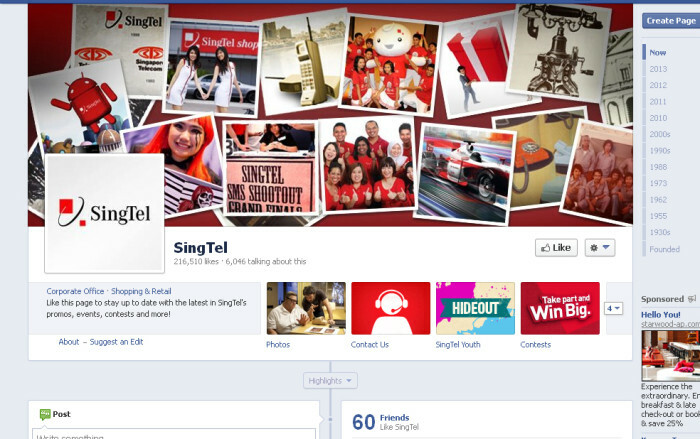 “Social media has become an important part of SingTel’s communications strategy. As many of our customers are active on social media, we are using Facebook and Twitter as highly effective channels for customer care and online marketing,” he said. Most recently, SingTel has been using Facebook to gather information from customers to help it to optimise its 3G network upgrades, said Buse. A Facebook app has been set up to make it easier customers to provide comments, and it places schedules and updates of its 3G network enhancements on its website. He said that so far, network enhancements had been completed for 15 of the top 20 shopping malls nominated by customers for upgrade via the Facebook page. While the telco has been steadily setting its sights on new Southeast Asian markets, sentiment for the local telco has been conflicted, with consumers lamenting the quality of its mobile and broadband services. Simon Kemp, Asia managing director at We Are Social, said that the brand receives a huge volume of feedback across all channels, according to the agency’s research. Hence, it is not surprising that it struggles to hit top marks when it comes to social customer service, said Kemp. Also, what it faces is not a social media problem per se, but an overall brand problem. “This is symptomatic of an approach that focuses too heavily on building and selling (tech) products, rather than identifying and servicing actual (human) needs,” he said. A complaint would have been the best time for brands to restore and reinforce relationships, but it is unclear if SingTel believes this, he adds, saying that the brand’s activities in social media still appeared “overwhelmingly one-way”. “The financial ROI of this is clear: in the long-run, it’s much harder to sell to new customers on the back of a universally poor reputation than it is to address existing customers’ problems and retain them,” said Kemp. Yolk’s Tan said SingTel’s attitude towards customers can be described as sanctimonious even. “Singtel has for the past year, been glorifying the way they’ve approached customer service on social as a success case study, while many would argue on simply looking at their social channels that they’ve hardly got it right,” said Tan. The challenge of customer service on social is one faced by all brands, he added. However, Tan felt that SingTel made the right move to go on social channels. “While we can accuse Singtel of failing, we can hardly blame them for trying because at least they’ve started trying (unlike in the earlier years of social media). “What they can do is to constantly look at their social media strategy and processes, pat themselves less on the back, and really crack the answer to this pertinent question of customer service on social channels,” he said. Media agencies: not creative enough? Hong Kong-based food company Lee Kum Kee has launched a new campaign for its Mahsuri sauce-range featuring Malaysian actor Shaheiz..
A Yahoo study shows that more than 60% of respondents believe native advertising content is more influential than banner advertisi..